1) Watami - One of my ultimate cravings is Japanese food and I thought since there are so many Japanese in Shanghai then finding a decent restaurant would be easy. I was wrong. In Shanghai, sushi and sashimi is twice the price as in Japan and regular rice is substituted for Japanese rice. We have ventured a couple of places and we were never satisfied. But the biggest disappointment for me is Watami. 2) TGIFridays - There is no need to thank God with the size of the servings nor the service. When I was a student in Tokyo I usually eat in TGIF once-a-week and order the appetizer for my lunch. In Shanghai, the appetizer is really good for only a few bites. Plus the taste is worst than my own cooking-slash-frying. 3. Greek Taverna (O Milos)- The first time I have ever tried Greek food in my life and I could not have been more disappointed. Carbs and flour without flavor (hey that rhymes!). The worst part is that the lamb meat tastes like goat. 4. Baan Thai - One day, Mos was searching for the Iran consulate when he accidentally saw this restaurant and got intrigued with its ambience and architecture looking from the outside. Hence, a month after, he invited me for dinner and taste Thai food in Shanghai for the first time. We ordered Tom Ka Gai, Green Curry, Crab Cake, and two fruit shakes. The verdict - BAD!! The servings are small, the taste is not spicy enough, and the crab cakes does not taste like crab. Worst, the service is terrible, 5 women chattering while we were eating and gave us boiled tap water. Which is more difficult: Japanese or Chinese? I’m interested in both Japanese and Chinese and I can speak and understand both to some level. After 3 years of living in Japan without formal Japanese courses, and a year of living in China, I realized that Japanese is harder to sound natural and native than Chinese. I still sound like a retard when I speak in Japanese. For Chinese, there are many instances when I talk to the locals and they don't get my tones so get flustered but when I found my bearing I can converse much more fluidly. The most difficult thing I encouter when learning Japanese is that the lessons on textbooks and schools are retarded compared to what is actually spoken. Have you ever heard anyone say the following? I swear that you will never, ever hear this sentence in your entire life. In fact, 90% of the time 私　(Watashi) and （あなた）Anata are not used. Compared this to Chinese where 我 (wo) and 你 (Ni) are commonly heard from a regular conversation. The lack of subjects usage in Japanese is a hurdle which until now I find difficult to overcome. Some people have the wrong idea that since Mandarin uses 4 tones (+ 1 neutral tone) then it is much harder than Japanese which is mostly flat. But the truth is, the tonal foundation is an advantage in the long run. I believe that languages are better learned through the ears than through the eyes (a proof of which is that deaf people cannot make themselves understood), and hence devoting a long time in learning the tones and the music of Chinese produces the long-term result. Anyway, I still hope that one day I can speak both languages fluently and even be able to translate from Japanese to Chinese and vice versa. I may not be the most qualified person to write about this topic but I'll give it a shot. I have been living in Shanghai for almost a year whereas I've only stayed a mere 48 hours in Beijing. Whenever I go to a new city, I always evaluate how "livable" the place is. So, I guess it's SHANGHAI after all. 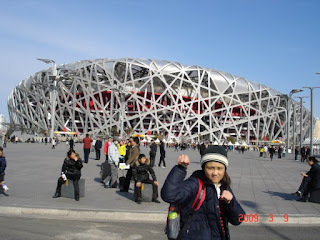 Two weeks ago, Mos and I together with my friends went to sightsee Beijing. Because we have read good reviews on the net, we tried the non-stop soft-sleeper Z-train. It was a well-spent 498 RMB . The rooms are quite comfortable and warm and we get 2 pillows each. On our way to Beijing since we are the only occupants of the room, then we get ultimate privacy. 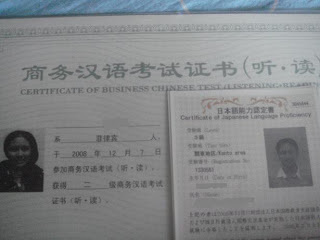 If you are married to an expat in Shanghai then one of the things that make your stay productive is to study Mandarin. There are plenty of language schools in the city but in my opinion, going to the university is still a better option. First of all, you have a good environment for learning. There is rigid and structured approach and there is the pressure in learning the language. You have midterms and final exams and also attendance is monitored and homeworks are encouraged. Another good thing is that university is rather cheap with an average of 9000 RMB per semester, which means 3 lecture hours a day, 5 days a week, for 4 months. I have been to two universities already -- Shanghai University of Finance and Economics, and Shanghai Traditional Chinese Medicine University. 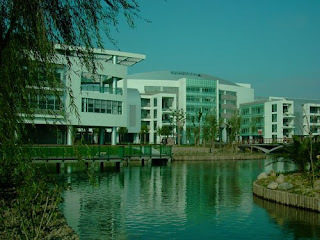 I decided to transfer universities since we live in Pudong area and it used to take me 2 hours to commute to Shanghai University of Finance. Another thing I don't like about that university is that some of the teachers are part-timers and hence they are not really experts. I think the university is trying to rake in cash by hiring cheap labour. I remember that our "Listening" course is handled by an undergraduate and no one really takes her class seriously. We also have a "Writing" class which I think is irrelevant as the teacher would only ask us to write formal letters or documents by copying the book format without teaching anything. For our "Speaking" course, the teacher speaks with a western provincial accent and I really cannot quite catch it. In Shanghai Traditional Chinese Medicine University, all of my current teachers have teaching degrees and speak more standard Mandarin. However, because the rule is 1 class per day, (2 days reading, 2 days speaking, 1 day listening) the teachers would already feel tired on the last minutes and would dismiss us early. I think it is a waste of time. 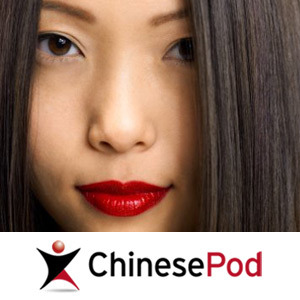 In order to compensate for this deficiencies of university lectures, I hired myself a private tutor which costs 40RMB per hour and I also subscribed to Chinesepod.com. This is helluva of a site and I really learn pretty neat expressions are not taught in the university. In the end, I think it's the podcast which helps me communicate more on a daily basis and on different functions, but it's the university structure that reinforced and provides the solid foundation. In my opinion, one cannot exists without the other. If you are living in Shanghai then one of the things which you should definitely consider is to find an AYI. An AYI is a woman who comes to your house and do household chores for you. That is, clean up, laundry, wash dishes, or even cook for you. It is possible to ask her to take care of your kids but prior arrangements is necessary. The best thing about AYI's is that they come really cheap. Our Ayi charges 15 RMB (around $2) per hour and she does her job perfectly well. I heard that there are some who can get better bargains at 10 RMB per hour. First, go to the security guard and ask him if he knows any Ayi who service other tenants on that subdivision. Chances are he is familiar with everyone who enters the premises regularly. It is best to ask people in the morning and late afternoon. Those on night shifts are probably not familiar with ayi who works during daytime. Tell the security guard your address and leave him your phone number so he will contact you if he found anyone available. The Ayi might also contact you personally. 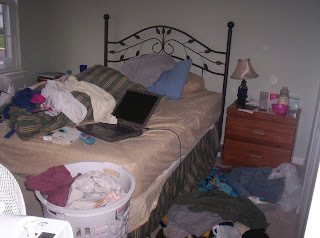 Ask the Ayi to come to your room so she can check out the place and for her to assess what she will need. Keep in mind that you need to buy all cleaning utensils and detergents, so if you don't have these things ask the Ayi to buy anything she might need and then give her some cash for them. Afterwards, you may ask for the receipt although they would probably ask less than 30 RMB ($4) for everything. Make sure that you also know how to say what time. Examples: 7:30 七点半 (Qi dian ban), or how long you want her to clean : 2 hours 两个小时 (Liang ge xiaoxi). Keep this in mind on you will have an easy time dealing with your ayi and take advantage of this great luxury that is hard to find anywhere else. Incredibly cheap at 50 RMB ($7) for 3 pieces including spices and pumpkin. Wanton Noodles with Real Soft Beef Tenderloins. Restaurant located in Zhangjiang High Tech Station, 2nd floor of the complex. Yes!! It's black! And it's healthy -- that is Korean Ginseng floating out there. Restaurant near DaMuZhi GuangChang on Century Park Station. One of the best things about living in Shanghai is that dining out is relatively cheap. For less than $50, you can have a sumptous meal with your family of 4 in a decent restaurant. There are plenty of choices and you might want to try authentic Chinese food. But after some time of doing this, you probably would want to cook your own dishes. Here is the bad news -- go to your nearby local Chinese supermarket and be amazed that there are no edible fresh. meat available. Well, unless you dig chicken's head and feet, or would be contented with frozen dumplings, then you know that this is definitely what you are looking for. 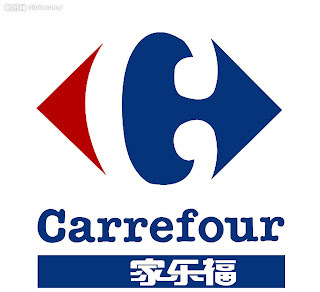 If you are lucky then someone may have told you where to find Carrefour. But if not, then you have to learn two things. First, you have to know how to say it in Chinese, and make sure that you say it correctly. The characters are 家乐福 which is (Jia Le Fu) in Pinyin. I advise that you use stress the first tones on the "le" and "fu". (Da Muzhi Guangchang), which is a 10 minutes walk from Century Park Station. I also know one branch in Northern Puxi which is 5 minutes by cab from 赤峰路 (Chifeng Lu Station Line 3). Another option for shopping is Hisamitsu in the mall near Jing'an Temple. The quality of food here is very good but expect to pay 3 times the amount as in Japan.